These were really rhetorical questions. I already knew the answer because every real estate agent we interviewed said the same thing. “Purchasing a house is a very competitive business today. Homebuyers want to imagine what it would be like for them to live in your house. That dictates a minimalist look. All the clutter has to go, including the mounted lake record great northern pike, books, the portraits of the kids … and your cats. Sorry, but no one wants to buy a house that contains any trace of cats.” Sigh. Gary and I sit in the public library while prospective owners walk through our almost empty house. Many of our possessions sit in a “pod” somewhere. We are only the second owners of this house in over fifty years and have lived here twenty years. Parsonages were the only option for pastors until 1993 when we received the first housing allowance in the West Michigan Conference. It wasn’t because we asked, though. Church leaders realized that neither of the two parsonages was suitable for our young family, and the Trustees wanted to get out of the parsonage business anyway. Completely naïve about home ownership, we spent our first night in sleeping bags on the floor because the moving van wasn’t arriving until the next day. On a sweltering summer night in late June we discovered that the air conditioning not only wasn’t working but every window in the house was painted shut! All five of us loved every minute of life at 2320 Elmwood Dr. SE. 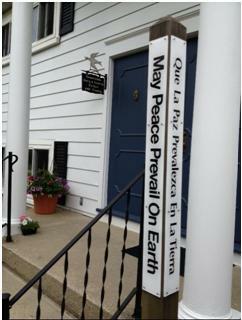 Years ago we proclaimed our house to be a shalom zone and purchased a peace pole, which proclaimed “May peace prevail on earth” in four languages: Japanese, Latin, Spanish, and English. Not to say that our house was always a bastion of serenity. We had our moments of tears, drama, and disagreements. One summer one of our children jumped off the second floor balcony “to escape my clutches.” I jumped, too, chasing that child down the street. Another child’s friend punched a hole in one of our walls. Gary and I often waited up for our teens to come home, and more than once I got up early to work out at the health club just as one of our children was arriving home from a night out only God knows where. We never worried too much about how our house looked, for it was not meant to be a museum. Let’s just say it had a lived-in feel. We put our feet on the couch (except for Gary). The kids’ friends were always welcome, and snacks were plentiful. We made a conscious decision that our children and pets came first, not the house. If the choice was attending a soccer game or cleaning the house, I chose soccer every time. Our grandson took his first steps in our family room. A succession of cats staged their own silent stalking for prey in the back yard. We had graduation parties in our home as well as a wedding rehearsal picnic for our oldest daughter. I absolutely loved mowing the lawn because, unlike ministry, I could immediately witness the fruit of my labor! Most of all, our home was a staging area. It was a holy space, a haven of discovery where we embraced real life issues in microcosm: growing up, finding our voice, discerning vocation, separating from parents, and living through the temptations, experimentation, and pitfalls of adolescence. Our home was a safe place where our children were guided to claim their own faith and become responsible citizens who care for the world and each other, especially the least, the last, and the lost. Yes, our home has its secrets. If only walls could speak. We were hard on this house, yet we always kept it up and made improvements. In turn, the house was always gentle and understanding with us, especially when we were learning to play the piano, trumpet, clarinet, and French horn. After serving as a staging area for our family’s growth over the last twenty years, our home has now become another staging area, a preparation for the next family. Home staging is the art of making a home memorable and appealing by emphasizing the best features of a house and providing emotional connection points that “hook” buyers. Staging employs decorating tricks of the trade and doesn’t have to cost a lot of money. Rather, staging recognizes that first impressions are made within fifteen seconds of a person walking into a home. Negative first impressions are almost impossible to overcome. We were told repeatedly that most home buyers today don’t want fixer-uppers. They want houses ready to be lived in, so we put our best work into preparing our home through painting, repairs, touch-ups, and deep cleaning. It was a labor of love and thanksgiving, and the house really shines now. 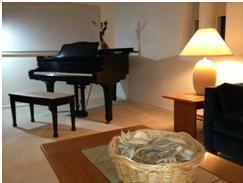 Convinced that most home buyers seek a house that can become a home, we staged our house to be warm and inviting. That’s why I believe that the core principles of house staging also apply to churches. Because our call is to make disciples and grow God’s kingdom, we need to give careful attention to how we stage worship because first impressions matter in congregations as much as they do in homes. Just as home buyers want their new house to be immediately livable, so church shoppers don’t usually want to commit to an unhealthy church or one where there is obvious tension. What do guests notice when they worship in a church for the first time? They notice the cleanliness and tidiness of the sanctuary. They notice whether and how the congregation acknowledges them. Unlike home buying, where marketers have discovered that it’s not wise for owners to be present when the house is shown, it is critical for church members to connect immediately with guests seeking a spiritual home. Guests need to know that their presence is not only recognized but desired. They notice whether the worship service helps them connect with God through Jesus Christ. Home staging is a marketing strategy as well as an investment designed to increase profit. How much time and energy are we willing to invest in staging worship so that we can build God’s kingdom? Every Sunday tens of thousands of people get in their car to try out a potential church home. They are wondering, “How will I be greeted? Could this be the place where I meet God and my heart is strangely warmed? Will my faith be nurtured and will I be empowered and equipped for ministry? Will I be encouraged to sow seeds of love and hope in the world and bear fruit? Will I find life-long friends here? Will I be accepted for who I am? Could this congregation become my spiritual home? Gary and I attempted to stage our home so that potential buyers could sense the grace, forgiveness, and joy that we experienced over the last twenty years. Fortunately, a family fell in love with our house and purchased it. I have no doubt that our house will quickly become their home because the faith, hope, and love remain. Why should we stage worship? Because all the world’s a stage, including the church. How might your worship experience be upgraded so that worshippers could imagine themselves making a difference in your community and the world for the sake of Jesus Christ? This entry was posted in dsblog and tagged home sales, moving, welcoming congregation by Bishop Laurie Haller. Bookmark the permalink. Claudia, you’ve aroused my curiosity about that initial experience at Birmingham First UMC! Gary and I are eager to begin our ministry at Birmingham and look forward to getting to know you. Laurie-Where are you moving to? Congratulations on the sale of your home. I pray that wherever you are going that you don’t stop these weekly emails. God bless you. Kim, Gary and I have appointed as part of the pastoral team at Birmingham UMC in the Detroit Conference. It’s a wonderful opportunity, but we will be sad to leave West Michigan. I will continue the blog. Laurie, West MI will be very sorry to have you leave us. I am originally from that side of the state, but haven’t lived there since (holy cow! 1977!!!) way too long ago. Birmingham is a beautiful city when I left, I am certain it has only improved since then. Can you do me a favor? I think I may have messed up something and am afraid that I may have stopped my ability to get your blog/email. Can you double-check and make sure I won’t have any problems? Thank you. And, once again, you will be missed. I will check and make sure you still get the emails, Kim. Thank you, Laurie. Unfortunately, I think I messed it up again. I swear that if you help me correct it when you return, I will not touch any of the settings again. God bless you and pray that your move went well. Another thought-provoking piece. A question, though. How does one “stage” a church building so that it appeals to a broad spectrum of people? Some people like flowers and soft cloths and and hand-embroidered wall hangings. Others think that feels like grandma’s house – old-fashioned, out-of-date. On the other hand, bold, angular, trendy coffeehouse-type decor feels cold and off-putting to different segment of people. A dilemma. Good question, Marj. It seems to me that we should “stage” our worship space to connect with the people we hope to reach, not the people who are already a part of the church. For the look inside your house , your heart , and your memories. It is very special reading at this “sunset” time in the GR home. I certainly laughed out loud when you went after the child through the open win,dow. A “normal” home it was. May the days ahead find challenges to meet, new friends to make, mountains to climb, and vistas to enjoy. Thank you for your comment, Joy. I look forward to meeting you. The parsonage is a mess right now, but slowly it is looking like home. See you soon!